This product is GMO free. This product is gluten free. This product is allergen free. This product is suitable for vegetarians/vegans. Coca-Cola Classic is the world's favourite soft drink and has been enjoyed since 1886. 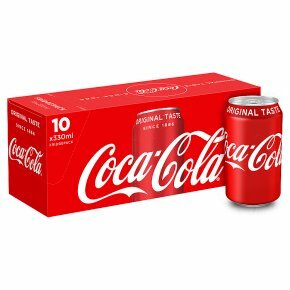 Great Coke taste Only natural flavours No added preservatives Gluten-free, dairy-free and nut-free Serve ice cold for maximum refreshment. Contains 10 individual 330ml cans Keep one cold in the fridge. Please recycle.